The 24-year-old cellist Harriet Krijgh is the successor designated by Janine Jansen herself. From 2017 Harriet will be the new artistic director of the International Chamber Music Festival Utrecht. Just like Janine Harriet is from Utrecht; she is exactly the same age as Janine when she founded the chamber music festival in 2003, and Harriet is just like Janine in that year, breaking through with dazzling speed as exceptional musician, both in the Netherlands and abroad. In Austria Harriet has built her own festival, “Harriet and Friends’. Click here for the LINK to the Festival. 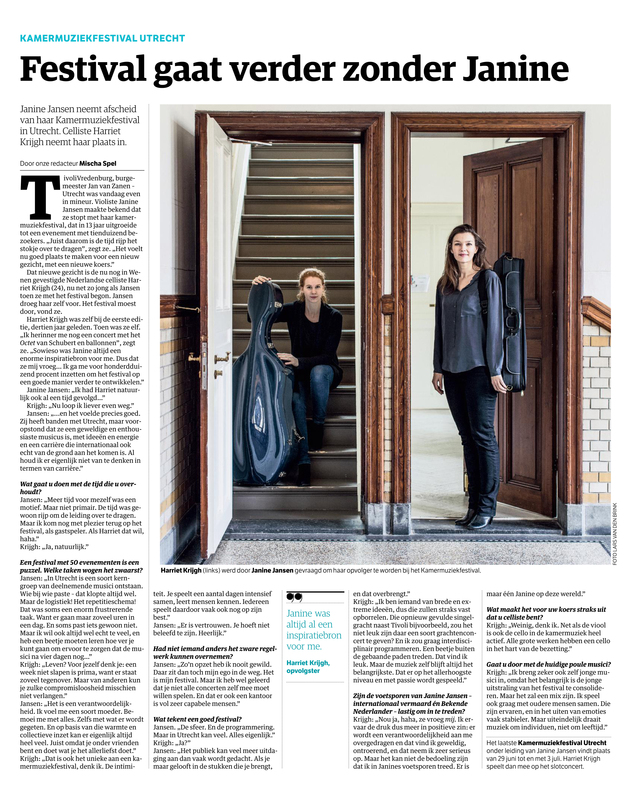 Click here to see the article in the Netherland´s newspaper NRC.